6/19 Cup of Coffee: Pawtucket scored 13 runs in a doubleheader sweep, while Portland split their own twin bill. Lowell prevailed in extra-innings, and the DSL Red Sox downed the DSL Rockies. The Pawtucket Red Sox defeated the Rochester Red Wings (MIN) in the first half of a doubleheader Wednesday evening by a score of 9-4. The lopsided result belies the competitiveness of the game, at least early on. The Red Wings jumped out to an early 1-0 lead in the bottom of the first; a lead that the PawSox took away with a two-run top of the third. With two on and two outs, third baseman Carlos Rivero slugged a two-run homer to left field, his first of the season. The lead was short lived for the PawSox, however, as the Red Wings scored three runs in the bottom of the fourth. Down 4-3 entering the the top of the seventh inning, the PawSox scored six runs giving them an insurmountable 9-4 lead. The big inning was marked by a second two-run homer from Rivero, which scored designated hitter Will Middlebrooks, who was 2 for 5 in the game. The other big blow came when center fielder Mookie Betts (Pictured, right), 2 for 6, delivered a three-run, bases-clearing double. PawSox pitchers Steven Wright, Chris Resop, John Ely, and Drake Britton combined to scatter nine hits, four runs, five walks, and five strikeouts in nine innings. In the second contest, the Pawtucket Red Sox downed the Rochester Red Wings (MIN) 4-1 on the strength of a four-run seventh, and final, inning. We pick it up in the final frame with the PawSox done 1-0. After a strikeout to begin the inning, Justin Henry and Shannon Wilkerson delivered back-to-back singles, leaving runners on the corners for Betts. Betts, 2 for 4, picked up an infield single, which scored Henry and moved Wilkerson to third base. Two more runs would come on throwing error, and the final run came on a sacrifice fly from designated hitter Ryan Roberts. Lost in the game was an excellent start from Pawtucket left-hander Chris Hernandez. Hernandez tossed five innings and gave up three hits and two walks; he struck out two batters in the game. 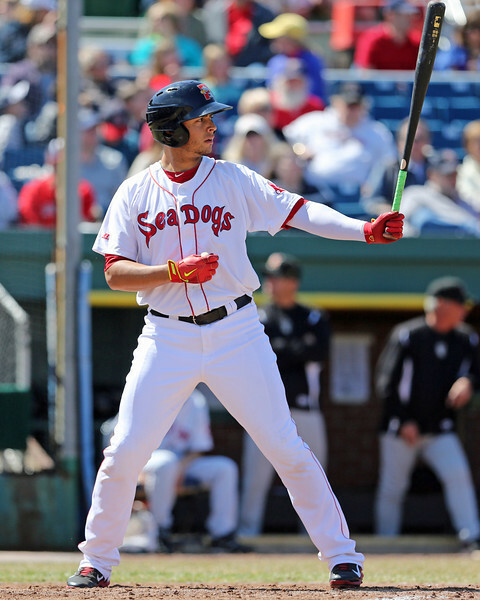 The Portland Sea Dogs were dropped by the Erie SeaWolves (DET) 8-6 in the first of a doubleheader. The game was close throughout, with the Sea Dogs even holding the lead for a brief moment thanks to an RBI-double from Sean Coyle in the top of the fifth. The lead was short lived as the SeaWolves would score three in the bottom of the frame. Portland was able to muster two more runs, but it wasn't enough as the Sea Dogs left the tying runs on base in the top of the ninth. Shortstop Deven Marrero was 3 for 4 in the game with one walk and one run scored. Left fielder Keury De La Cruz was 3 for 5 in the game. Matt Spring and Stefan Welch both blasted two-run shots, their third and fourth of the season, respectively. 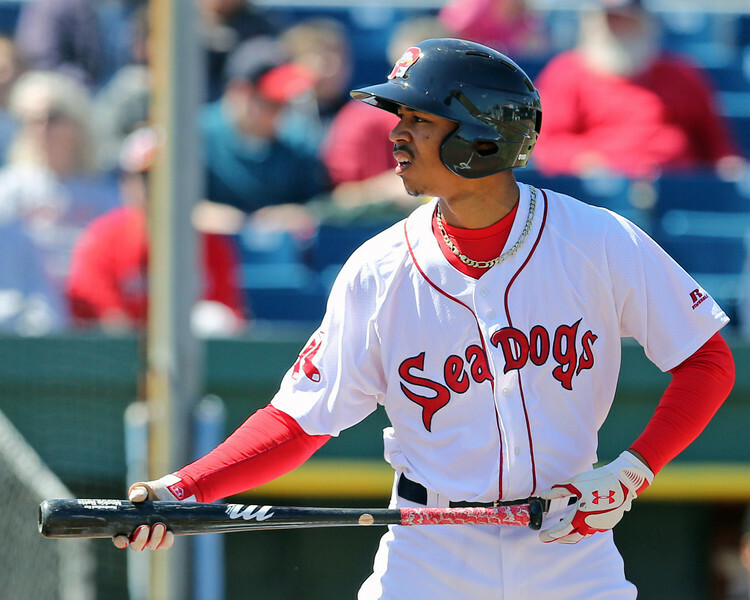 In the second half of the twin bill, the Sea Dogs topped the SeaWolves (DET) 5-1. Portland starter Luis Diaz, a right-hander from Venezuela, was superb in six innings. Diaz surrendered only one hit and one run while striking out four on his way to his first Double-A win. Diaz was making his first start since being called up from High-A Salem. The game was one with a big four-run top of the fourth inning. The inning was punctuated in the biggest way by first baseman David Chester, who slugged a grand slam. The home run was Chester's first this season. Marrero added a solo shot in the top of the fifth, his third of the season. After being knotted for most of the game, the Lowell Spinners were able to prevail over the Connecticut Tigers (DET) 2-1 in extra innings. The heroes for the Spinners were Raymel Flores and Mauricio Dubon, whom both played key roles in the 12th inning. Flores entered the game as a pinch runner and promptly stole second and third base, putting himself in scoring position for Dubon, who was 2 for 6 in the game. Dubon singled him home for the winning run. The starter for the Spinners was right-hander Jason Garcia. Garcia struck out five in five innings while surrendering zero runs on two hits in his second start of the season. Reliever Oscar Perez picked up the win. He went four innings and gave up no runs and two hits. The DSL Red Sox topped the DSL Rockies 6-3 after scoring five runs in the final two innings. Two players collected multi-hit games: shortstop Carlos Tovar, and outfielder Raiwinson Lamedia. Rafael Devers, who served as the team's designated hitter, was one for five with a run scored. DSL starter Gerson Bautista was strong in six innings of work. He surrendered only one run on two hits and one walk in the game. Player of the Day: The day's honors go to Pawtucket third baseman Carlos Rivero (Pictured, left) who slugged his first two home runs of the season in the PawSox 9-4 win in the first leg of a doubleheader. In 24 games with the PawSox, Rivero has hit .244 with 15 RBI. He currently has an OPS of .646. Photo Credit: Mookie Betts and Carlos Rivero by Kelly O'Connor.